New York City is alive with radical theatrical interpretations of the writings of Anton Chekhov. 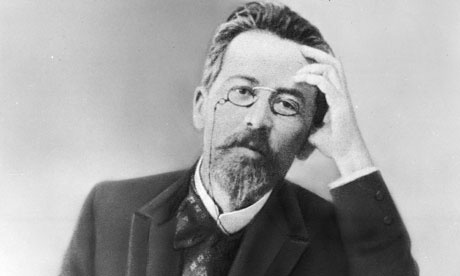 The nineteenth-century Russian physician, dramatist, and author is venerated in classical theater circles for his revolutionary contributions to theatrical realism in works like Uncle Vanya, Three Sisters, and The Seagull. But this season his work is receiving a dramatic makeover in a coincidental series of adventurous new adaptations by luminaries of New York’s contemporary performance avant-garde. Each artist on this panel takes a particularly idiosyncratic approach to Chekhov. Annie Baker’s critically acclaimed Uncle Vanya at Soho Rep emphasizes the familiar lull of contemporary conversation while presenting period details with equally matter-of-fact familiarity, placing the entire audience inside a carpeted A-frame house built inside a theater. Kristen Kosmas’s There There at Performance Space 122 this January contemplates the meta-theatrical metaphysics of celebrity actors performing on stage, putting forth the absurd premise that Christopher Walken’s female understudy Karen is forced to take the stage in a one-man adaptation of Three Sisters (that is simultaneously being translated into Russian). The Man in the Case, starring Mikhail Baryshnikov, coadapted and directed by Annie-B Parson and Paul Lazar of Big Dance Theater, takes a short story by Chekhov about a narrow-minded schoolteacher who is obsessed with following rules and transforms it into a dance-theater piece for five performers spliced with found text from an instructional video on how to open a door and detailed discussions of turkey hunting tactics. And finally, New Museum artist-in-residence Tina Satter of Half Straddle is presenting Seagull (Thinking of you) with Performance Space 122 in January. A dark and comedic group portrait set to an original Russian folk metal-inspired score, Tina Satter’s Seagull (Thinking of you) revels in the strange resonances between Chekhov’s Seagull and the Half Straddle ensemble of female and/or genderqueer performer/artists brought together for this particular show. Join these artists as they discuss their productions, their individual motivations for adapting Chekhov, and their thoughts on the current spate of contemporary Chekhovian adaptations.